A five-volume graded anthology of short piano pieces in Romantic style, featuring the great German composers of the 19th century, as well as works by Rimsky-Korsakov, Moszkowski, Glazunov, Albeniz, Granados, Delius and many others. 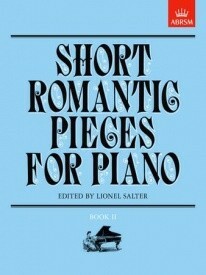 If you like to wallow in Romanticism, then these collections are most definitely going to be your sort of thing! Each series is carefully graded and offer a variety of keys, time signatures and moods, providing invaluable practice and concert repertoire through the grades. Compiled and edited by Lionel Salter.